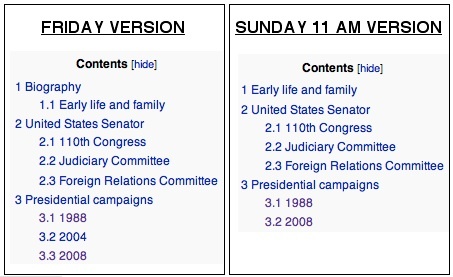 The Friday evening version of Joe Biden's Wikipedia entry remains firmly ensconced in a Firefox tab on my desktop, so it can be compared to its current form as Obama-Biden's busy bees brush it up. I'm doing comparisons as time allows, and there isn't much of it at the moment. Amazing. Where did 2004 go? Joe Biden thought that John McCain would be perfectly qualified to be Veep on the Democratic ticket in 2004, and thus fit to serve as President if something should happen to John Kerry, his party's nominee. Now we get to hear Joe Biden tell us why John McCain shouldn't be president. Incidentally the two footnoted links in the 2004 picture both work (here and here). What are the odds that anyone in traditional media will take any interest in the ongoing whitewash? Or is it really possible that they're participating in it?